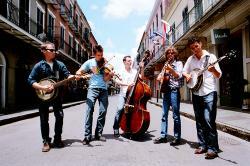 Old Crow Medicine Show is an Americana string band based in Nashville, Tennessee. Its music has been called old-time, folk, and alt-country. Along with original songs, the band performs many pre-World War IIblues and folk songs. It has recorded since 1998. Bluegrass musician Doc Watson discovered it while its members were busking outside a pharmacy in Boone, North Carolina in 2000. With an old-time string sound fueled by punk rock energy, it has influenced acts like Mumford & Sons and contributed to a revival of banjo-picking string bands playing Americana music�leading to variations on it. The band released five studio albums�O.C.M.S. (2004), Big Iron World (2006), Tennessee Pusher (2008), Carry Me Back (2012), and Remedy (2014). Their song "Wagon Wheel", written by frontman Ketch Secor through a co-authoring arrangement with Bob Dylan, was certified platinum by the Recording Industry Association of America in April 2013 and has been covered by a number of acts, including Darius Rucker, who made the song a top 40 hit. The band was featured along with Edward Sharpe and the Magnetic Zeros and Mumford and Sons in the music documentary Big Easy Express, which won a Grammy Award for Best Long Form Music Video in 2013. They performed on the Railroad Revival Tour across the U.S. in 2011. They appeared at the Stagecoach Festival 2013 and multiple times at other major festivals, e.g., Bonnaroo Music Festival,MerleFest,:2000:2004:2008:2014 Telluride Bluegrass Festival, Hardly Strictly Bluegrass Festival,[w 4]:2004:2009 and Newport Folk Festival. They make frequent guest appearances on A Prairie Home Companion with Garrison Keillor. The group received the 2013 Trailblazer Award from the Americana Music Association, performing at the Americana Honors & Awards Show. They were formally inducted into the Grand Ole Opry at a special ceremony at the Grand Ole Opry House in Nashville on September 17, 2013. Old Crow Medicine Show's songs are represented by Downtown Music Publishing.